The course is designed for personnel who provide skilled support services (i.e., utilities, demolition, debris removal, heavy equipment operation, governmental personnel other than fire/rescue/law enforcement, non-governmental organizations such as Red Cross and the Salvation Army, etc.) or site cleanup services in response to a disaster. Participants will leave the course with an awareness of the safety and health hazards that may be encountered at a natural or man-made disaster site. They will also have an understanding of the importance of respiratory protection, other PPE and proper decontamination procedures that may be used to mitigate hazards. 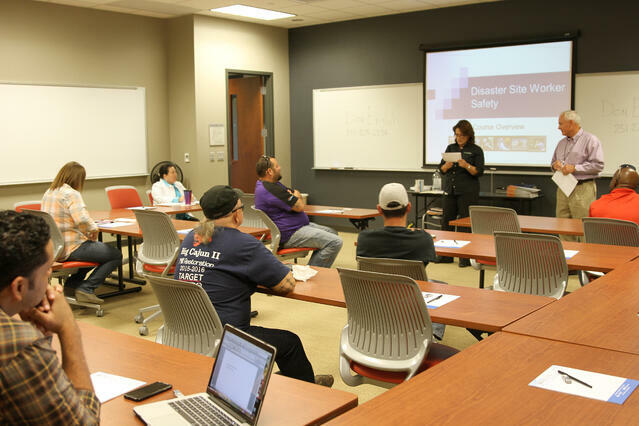 Participants at the Aug. 31 OSHA Disaster Site Worker Course were welcomed by Alliance President and CEO Kathy Trahan who spoke about the recent flooding and introduced instructor Don English. The first round of classes was held on Wednesday, Aug. 31 and Thursday, Sept. 1 at the Alliance Safety Council Baton Rouge Training Center. Two additional classes will take place on Wednesday, Sept. 7 and Thursday, Sept. 8 at the Baton Rouge Training Center located at 10099 N. Reiger Road. For more information, call (877) 345-2515. To register for the course, click here.